Daily planner with half-hour appointment list, todo's and notes on an A4 size paper in a vertical, portrait orientation. 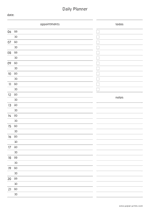 Daily planner with half-hour appointment list, todo and notes on an A4 size paper in a vertical, portrait orientation. Four copies of a todo list on an A4 size paper in a vertical, portrait orientation. 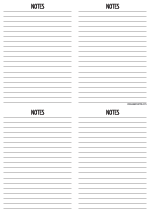 Four copies of a notes layout to make four A6 sheets, printed on an A4 size paper in a vertical, portrait orientation. Double daily planner with half-hour appointment list, todo and notes on an A4 size paper in a vertical, portrait orientation. When cut in two you will have an A5 size planner. 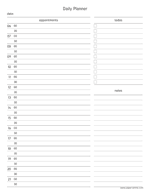 Double daily planner with half-hour appointment list, todo and notes on an A4 size paper in a vertical, portrait orientation. When cut in two you will have half letter size planner. Decision making on a letter size paper in a vertical, portrait orientation. This sheet helps solving problems by organizing ideas, thoughts, pros and cons. Decision making on an A4 size paper in a vertical, portrait orientation. 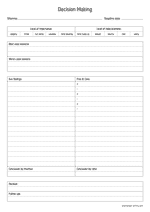 This sheet helps solving problems by organizing ideas, thoughts, pros and cons. Task priority schedule on an A4 size paper in a horizontal, landscape orientation. This matrix is based on the principals of urgency and importance, it helps to sort tasks and spread them reasonably over time. Task priority schedule on a letter size paper in a horizontal, landscape orientation. This matrix is based on the principals of urgency and importance, it helps to sort tasks and spread them reasonably over time.